Ashridge College, a few miles north of Berkhamstead in Hertfordshire, was founded in 1283 and dedicated in 1286 by Edmund, Earl of Cornwall, who was born at Berkhamstead, and who died at Ashridge in 1300. 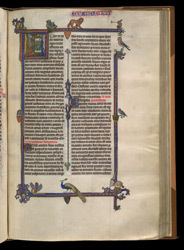 His arms are in the margin of the first page of the Gospels, and it is therefore likely that the book was commissioned by him for his foundation. The historiated initial 'F' at the start of the Gospels depicts the angel appearing to Zacharias while he is censing the altar (Luke 1:11). The arms on the escutcheons around the border are those of King Edward I of England; Edward, his son; Richard, King of the Romans; and Edmund, his son, Earl of Cornwall, the probably patron of this manuscript.